This is just a spectacular piece of box art. No snark required. Every shoot-em-up that stands the test of time has a great gimmick, one that acts as a cornerstone for the game’s foundation. 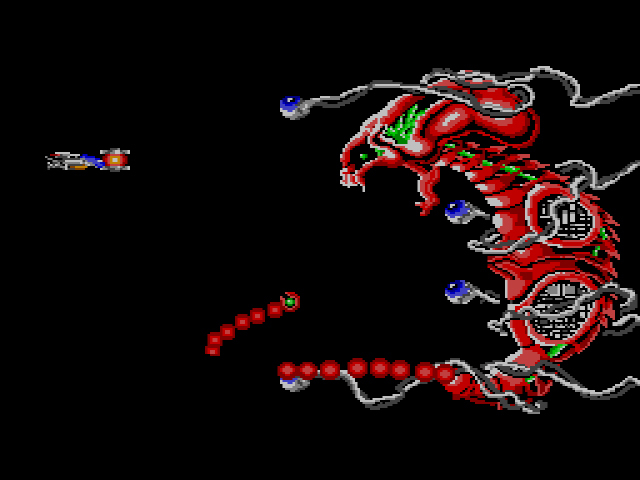 Life Force‘s levels were designed specifically with two player co-op in mind. Gradius gives you the ability to choose your weapon/shield upgrades in a rotating upgrade wheel. 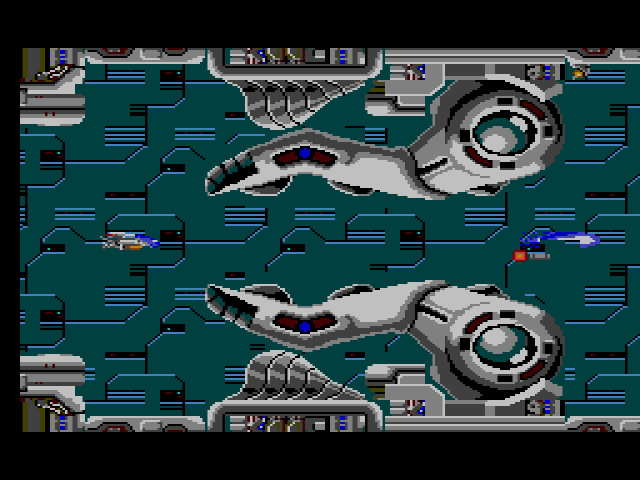 R-Type has the Force device, a detachable pod that can be sent either backwards or forwards into enemy chaos. The Force device is all-powerful and can’t be destroyed, which makes it the perfect partner in your war against the Bydo Empire. If the device is attached to you in the front or back, it also acts as a type of shield, absorbing any projectiles sent your way. To really succeed with R-Type, you’ll have to not only memorize enemy patterns, but also learn when to deploy the Force device in any given situation. Each level sends out tons of enemies in all directions, and often the only way you’ll be able to survive is with the the Force device’s help. As with most shoot-em-ups, when you die in R-Type, you lose all of your weapon upgrades, including the Force device. Because the Force device is so essential for your survival, however, you’re given it quickly after you restart the level; just shoot one of those bouncing rabbit robots, collect the blue orb, and the Force device will return to you, like a robot dog welcoming home its master. This generosity is a far cry from Gradius. In the latter, if you die a few levels in, you may as well restart, due to the lack of power-ups the game gives you after a certain point. While the Force device won’t prevent your death, it is always a welcome ally, particularly when you restart in claustrophobic, enemy swarming areas. The Bydo Empire and H.R. Giger were constantly collaborating. The Force device is an ingenious gimmick and the backbone of R-Type, but the eerie ambient level designs, deliberate pacing, and solid weapon upgrades add considerable depth and life to the game. As you fly through the Bydo Empire’s underwater caves filled with intestinal sea anemone, you can’t help but feel creeped out – even as you’re trying to stay alive. The shooting gets desperate at times, but the enemies rarely overwhelm when you’re ‘roided out with upgrades. In addition to the Force device, you can acquire two orbs that surround your ship’s top and bottom and shoot in either direction. There’s also missiles, anti-land lasers that look like diarrhea caterpillars and don’t do much of anything, reflecting lasers, and anti-air ring lasers. The latter two are the strongest and best weapons to have, and with the Force device by your side, make you feel invincible. Nothing like an alien graveyard to make you feel at home. 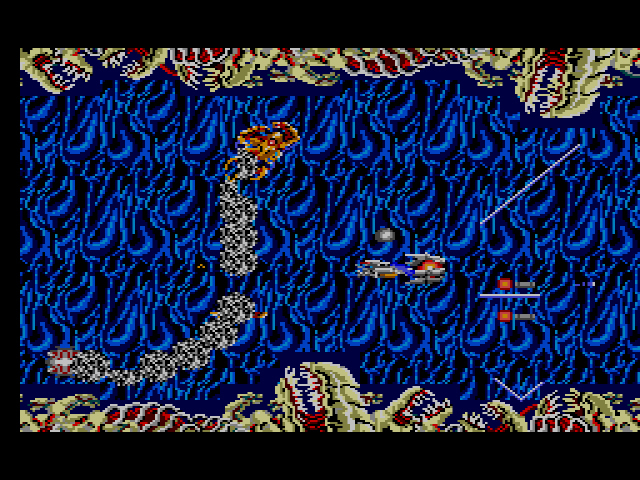 But just in case you thought I was a shmup savant, make no mistake: R-Type is incredibly hard and requires insane amounts of trial-and-error and memorization to make it through. This difficulty is part of the game’s charm, though. I mean, would you really feel like you had accomplished something as significant as destroying an evil alien empire if the eight missions given you were easy? Now I’m playing with power. 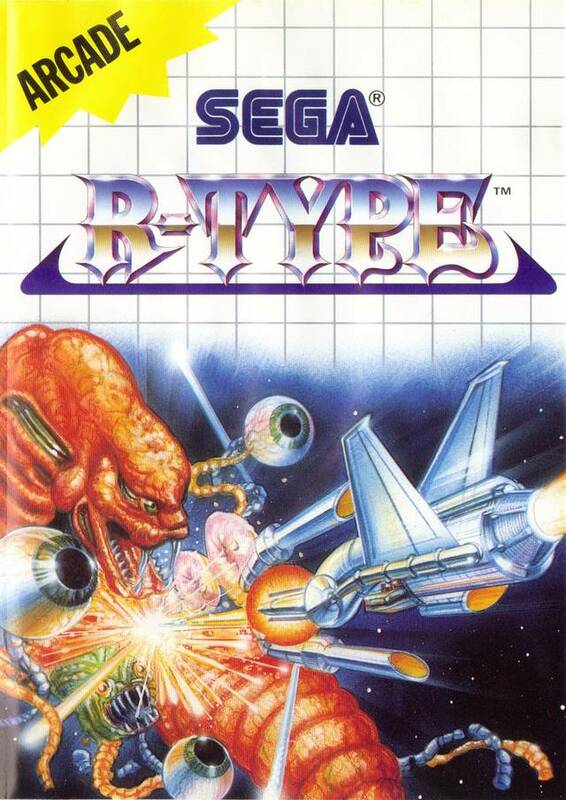 R-Type makes up for Thunder Blade, Blade Eagle 3-D, and all the other half-assed shoot-em-ups I’ve been forced to play on the Master System. Not only is it the best shmup I’ve yet to play on the console, it’s one of the finest to emerge from the genre’s golden period. Truly one of my favorite SMS games. And my favorite 8-bit shooter hands down. It’s amazing they were able to fit the game on one cart. The PC-Engine version came out as two games, half on each. It’s great to have arcade quality on the PC-Engine. 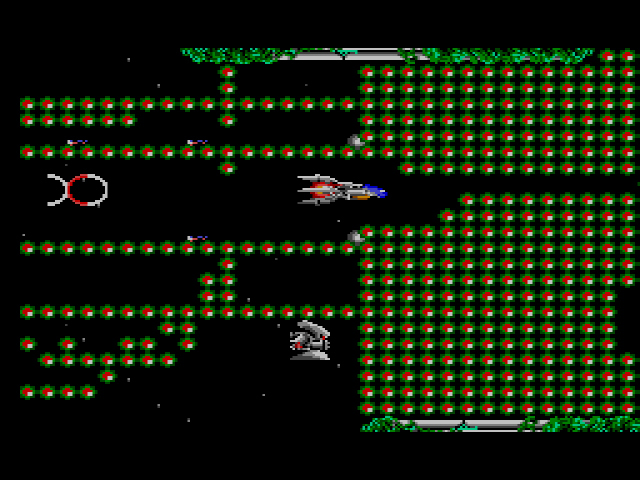 But the SMS still is a great looking game and has all the levels. I think my favorite level is the one where the whole level is you attacking the giant space ship. Where you scroll forward and back in one long battle against it. It was really the first time in any game something like that was done. Always enjoyed the large bosses and music in this game. And the gameplay is tops. The giant space ship level is one of my favs too. Glad we’re able to agree on this one, Sean. Completely agree this game is fantastic and the Master System cartridge is a brilliant conversion. What I particularly like is how the sprite flicker never affects the enemy projectiles. Which in itself is damn good programming, but also ensures the game never feels cheap and if you die then it’s your error. The adverts where right ! I have so many good memories of this game back in the day. Hard does not describe it, more like “insanely brutal”, and I was actually one of the few that could beat Shinobi with no cheats. Of course I never could beat it myself, but there is an invicible code that allowed me to see the ending. Oh yeah, and a secret level! This game had it all. This game blew my mind was I was a kid. I remember picking this game and phantasy star for $10.00 each from a rental store that was going out of business near me. That was a great day. I never could beat the game with out the invincibility code. I personally think this is one of the most impressive looking games on any 8-bit system and the music is one of the Master System’s best. Great review to an amazing game! Really not my cup of Klingon coffee. When I played this I remember it felt like I was trying to stop the Titanic from sinking by using a spoon to bale it out. This game looks great for 8-bit and I remember it controlling really well too. I never did like it as much as everyone else though. Not a big shooter fan I guess. It’s just not much fun to me.